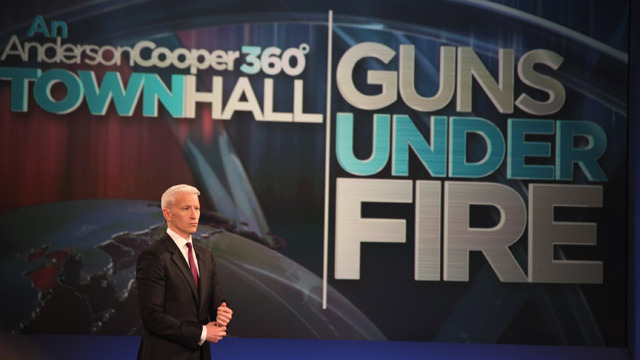 At noon today you can find Anderson Cooper, Dr. Sanjay Gupta, Jeffrey Toobin and AC360 producer Jack Gray in a live Google+ Hangout on CNN.com and AC360.com. With your help, they're continuing the conversation they started last night with many others in the "Guns under fire" town hall. What questions did the program raise for you personally about gun violence in America? Leave a comment here or on the AC360 Google+ page. The show included guests with a wide range of perspectives on gun laws and related issues like care for children with mental health issues and the culture of violence. An NRA board member shared the stage with the president of the Brady Campaign; a man whose father was gunned down in the Sikh temple shooting told his story, and so did a young mom who protected herself and her baby's life with a shotgun when intruders broke into her home. Although some panelists fundamentally disagreed with each other, the dialogue was honest and sincere. Their differing opinions were a fresh reminder of the deep and diverse beliefs about gun laws in this country. Did any of your views change after hearing the exchange of ideas? Did you become more firm in your stance on how the country handles gun crimes and background checks? Share your reaction or questions and you may see them discussed in the Hangout at 12 p.m.
Watch highlights from the "Guns under fire" town hall. Here's my take. The people plead with the President to get guns off the street. The president listens. The President pleads with his advsiors and Law Enforcers to get guns off the street. The advisors and Law Enforcers listen. The President, his andvisors and Law Enforcers plead with the people to get guns off the street. Not all the people listen. Listen Get the guns off the street. Why doesn't someone actually read the 2nd ammendment to the constitution! It gives the right to bear arms to state militias – not individuals. In fact, when the constitution was written it was extremely rare for an individual to own a gun. Why? Because they were so expensive. This debate misses the mark on so many levels it is frustrating. People on both sides rewrite reality without taking the opportunity to recalibrate and decide what is right for OUR time. Brian, your statement that, " In fact, when the constitution was written it was extremely rare for an individual to own a gun." only shows that you either didn't make it through the third grade, or you went to school that didn't teach history. Weapons were commonplace even "in town", and essential "out of town" (out of town being 5 miles away and farther). In the "out of town" homes it was "rare" that there WASN'T a rifle. I guess you believe the civil war was fought to free the slaves too wasn't it? Here is the 2nd amendment as ratified and authenticated by Thomas Jefferson, "A well regulated militia being necessary to the security of a free state, the right of the people to keep and bear arms shall not be infringed." Now I suppose you are going to say that, "...the right of the people..." means the local government and was not to mean "individuals" at all. This part of the second amendment has held true in the supreme court to mean "individuals" more than once. But the part I like is the first part of the Bill of rights. These rights are "inalienable". That means that even if congress did pass a law that said that NO individual could own a weapon, the law would be wrong. The last part of the 2nd amendment re-iterates this to all of eternity, "....shall not be infringed." Meaning future members of public office did not have the authority to say otherwise. In fact if you follow the Bill of rights to the letter, the ban on full automatic weapons from civilians should be lifted. And to that end, I will fight probably to the end of my days. There should be NO weapon that police and military have, that should be excluded from the sale to a private citizen in the USA. The reason that should be true, is because the INTENT of the second amendment was that the citizens had the right to fight off any tyranny that came to be. And so it becomes not only the right, but the obligation that the citizens of the USA fight against King Obama. Instead of debating gun control or gun rights, when will we as a country discuss gun ownership responsibility? Maybe there should to be stronger penalties for owners who do not store their weapon properly, with a gun lock, and in a gun safe. Many gun owners may be law abiding, and have no intention on committing these crimes, but how many mass shootings have involved weapons easily stolen from a neighbors home, or from a parents closet. Nothing can prevent all shootings, but this might be the simplest thing this county could do to reduce them. Also, background checks should be universal. Many people are fingerprinted, and have their background checked when getting a new job. So you blame the victim that had his house burglarized because a thief stole his guns? How about we stop the thieves? I understand that criminals will not follow any gun laws that we already have or that we create. I also understand that we need laws to at least set a boundary between right and wrong that we as a society can agree on. That being said, as a gun owner and specifically one that has a civilian AR-15, targeting lawabiding citizens doesn't seem to have a good track record in terms of stopping violence. Especially since most of these gun related crimes are being committed with hand guns. I believe the FBI stats show only 2% from long guns. I believe that the real long term solution is going to be education and training. This works for 18 year olds using actual military weapons. I have no problem with the idea that I need to demonstrate a willingness to educate myself via gun education classes and safe handling classes. I also don't mind the idea of showing that I'm proficient to use one if I should want to conceal carry. I'm also okay with a small, "reasonable" tax that helps fund mental health initiatives since funding seems to be hard to come by for that. However, telling me I simply can't have something because I'm nor responsible enough to do so is a slap in the face of millions of gun owners who have owned these types of weapons for years on end without incident. The way things are in the US, why should I not have a gun with me at all times? Throughout this entire debate over the past few months I haven't really heard anyone, in the media, talk about the purpose of the second amendment and how it relates to the current gun control debate. The purpose of the second amendment and the rest of the bill of rights for that matter is to protect the citizenry from tyranny from our government. While I do agree that we need to keep guns out of the hands of violent criminals and certain people with dangerous mental illness, I am hesitant to accept gun control that affects the general population. Two of the main items that are being discussed are assault type weapons and magazine capacity. If our local police and uniformed military have access to these types of weapons and magazines, then our citizenry must also have access as well to preserve the purpose of the second amendment. We must be able to readily and effectively fight back against our government and maintain that threat of force we hold. We are also a check and balance. We have a gun problem ..a major one...anybody buying a gun should also take full responsibility of that gun....making sure it's locked up...away from any nut including a family member... if that gun is used improperly by anybody...you the owner will be partially responible!!! Your rights to own that gun should be also taken away..so go ahead buy a bazooka..or a canon...just be sure it doesn't kill a frickin 6 year old!!!! I disagree with Jeffrey Toobin's opinion that somehow the right to defend ourselves is only a "recent" event from the Supreme Court Heller decision. This flies in the face of state constitutions create in the same timeframe such as Pennsylvania and Vermont's that explicitly state the right to bear arms for the defense of themselves. To somehow think that the 2nd Amendment only grants the people to defend their country but _not_ themselves, and yet be inserted 2nd in a list of the Bill of Rights is baloney. The right to defend themselves was always implied, every able bodied male in the day had a musket and knew how to use it. What is sad, is that we now live in a day and age where we're even arguing about it and have to explicitly state it. To say that we have no right to defend our lives voids our right to life. Hey, here is an idea that would be EASY to implement and would have no impact on the legal owners of guns. Simply make it a mandatory 5 year ail term if a person is found with ANY TYPE of firearm or ANY amount of ammunition in their possession, and have no gun licence. An exception would be made if they have a lapsed gun licence that they can renew, however if it is not able to be renewed, then jail. You do not have to have a "gun license" to own a firearm. Your license is called the constitution. Therefore your "EASY" fix would actually be an infringement on legal gun owner's rights. Amend the constitution if you feel that in order to exercise your 2nd amendment rights you should be required to get a license. People should not be so willing to give away their rights. Even the ones they don't like. My question is simple. The history of gun control in the US has been a consistent one of incremental steps toward total civilian disarmament. The folks behind the push, such as the leaders of the Brady Coalition, have come out and said publicly that they don't believe that guns belong in civilian hands. Why should I trust you when you tell me that you're not out to ban guns, but just want to enact "common-sense restrictions"? Especially when the actual proposals are the same old tired things that were tried and found to be ineffective?